If we thought about it, we couldn’t name very many people we know who are not on some type of social media. This is because there are 3 billion internet users in the world and 2 billion of those have some kind of social media account whether it be Facebook, Google+, Twitter, Instagram, Snapchat or one of the dozen or so others. 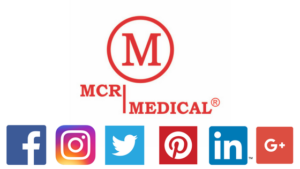 Here at MCR Medical we recognize that a large number of our customers and our potential customers use social media. We, of course, want to reach them. But that’s not the only reason. There are several other reasons. 1. It tells us about them: Who they are? What they like? 2. We are able to provide even more customer service: We read and respond to what they need through posts or direct messages. 3. Share information: This can be anything from new products, sales and/or our company culture. 4. Build relationships: We enjoy seeing your posts and responding to them and we hope you do the same. 5. Customer control: We don’t use email for marketing reasons but we do choose to use social media so that customers have complete control over whether they choose to receive information about product releases, notice of sales, etc. We hope you take a few minutes and follow the links on our website to see, first hand, how we use social media.